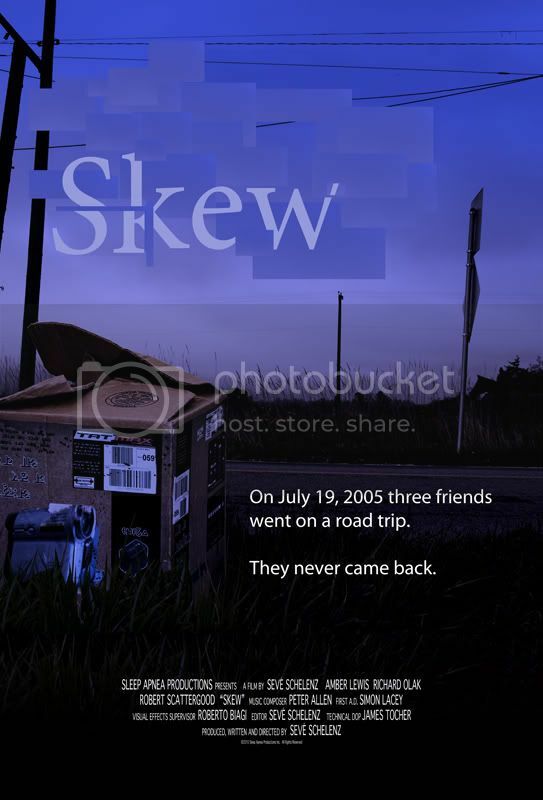 Skew is a new "found footage" horror film that has been making the rounds at film festivals over the past year. Being the hermit that I am, I was fortunate to receive a screener of the film. Ever since seeing The Blair Witch Project in the theater I have been a fan of this sub genre and jump at the chance of seeing new "found footage" films. Skew is about three friends, Rich (Richard Olak), Eva (Amber Lewis) and Simon (Rob Scattergood) who go on a road trip to their friend's wedding. Rich and Eva are dating and we learn that Simon and his girlfriend (who was supposed to come on the trip) are having some problems in their relationship. Simon brings along a videocamera to record the trip, much to his friends' dismay. As their trip commences, strange things start happening and soon people (and animals) that they meet along the way start dying. Simon finds a connection with the murders but is afraid to tell his friends. To complicate matters more, Simon and Eva start showing that they have feelings for each other, causing a rift between the trio. Skew reaffirms my faith in the "found footage" genre by featuring everything that makes these films great. It is filled with creepy atmosphere and effective camerawork, some jump shocks and also complicated characters that are far more developed than your normal horror film. Sometimes the build up for these films drags and you can't wait for something to actually happen, but the interaction between Skew's characters is just as gripping as the rest of the film. The actors excel at their roles and make the film believable. This is simply one of the best "found footage" films I've seen. With these accredited online colleges you can take the writing courses you need to be a professional critic like Siskel and Ebert.